Since I began blogging back in 2005, I have become cyber friends with quite a few people around the world. These friends have become a part of my daily life. There are aspects of their lives, personalities, and creative endeavors that I know as much, or more, about than I do of my "real life" friends. I've had the pleasure of meeting two cyber friends ... to add faces, gestures, and expressions to the images formed of them in my mind. The first was Kay of "Out of the Basement". She came to meet me at Good Good's Gallery when I was the featured artist a year ago last September. If I hadn't been so steeped in prairie flowers this summer, I'm sure we would've gotten together to "play". I hope that can happen next summer. The second was Karen of "Threadstory" while I was in Chicago for the holidays. We met for a quiet cup of tea at Starbucks before going to my son's house. I wanted our initial meeting to be without the confusion and intrusion of kids, animals, and husband. Karen brought some of her wonderful art pieces for me to see ... and touch. Hearing Karen talk about her process and techniques for creating these pieces while holding them in my hands was pure pleasure. The rich textures created by her embroidery are amazing. The photo I took of them spread out on the sofa most certainly doesn't do them justice (someone's little fingers readjusted the setting dial on my camera which I didn't notice until much later). All of these pieces can be seen and read about on Karen's blog. I would love to meet any of you, my cyber friends. If you are in my vicinity either here in Tennessee or in Michigan please let me know. If I visit your area, you'll get an email from me. Nellie, I had such a great time with you! So glad your son owns so much of your work so I could see it up close. Thank you again!! I've had the pleasure of meeting quite a few of blog friends, and I have to say, previously not having friends who quilt, the blog friends have very easily become fabulous life long friends. :-) Enjoy and happy sewing! You know that any time you can come to Houston to the quilt show, I am usually there and willing to meet you! It's amazing to me how the internet has opened up our world. I have met people from every corner and some I can truly call friends. Not only friends...I met my husband on the internet and never knew anyone to even come close to knowing me like he does! Isn't it great? What lovely work Karen does Nellie, and I know the thrill of meeting up with a bloggy friend for the first time. Sadly, I have only managed it once. Karen, thanks. I'm glad you got to see one of Paula's clocks at my son's house, too. Debra, thanks for the invite. IF I ever go to a show in Houston, I would certainly get in touch. However, I tend to avoid large venues. Large crowds and noise stresses me out due to fibromyalgia. 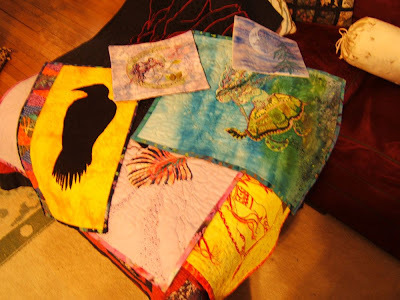 Also, in the past I have come away overwhelmed and disheartened by exposure to so many fantastic quilts ... I get the feeling that "everything" has been done ... what's left? In the meantime, I enjoy my cyber friendships with all of you ... getting glimpses of your life and knowing your art through your blog postings.